One more appetiser from the forthcoming Jünger translation "The Adventurous Heart. 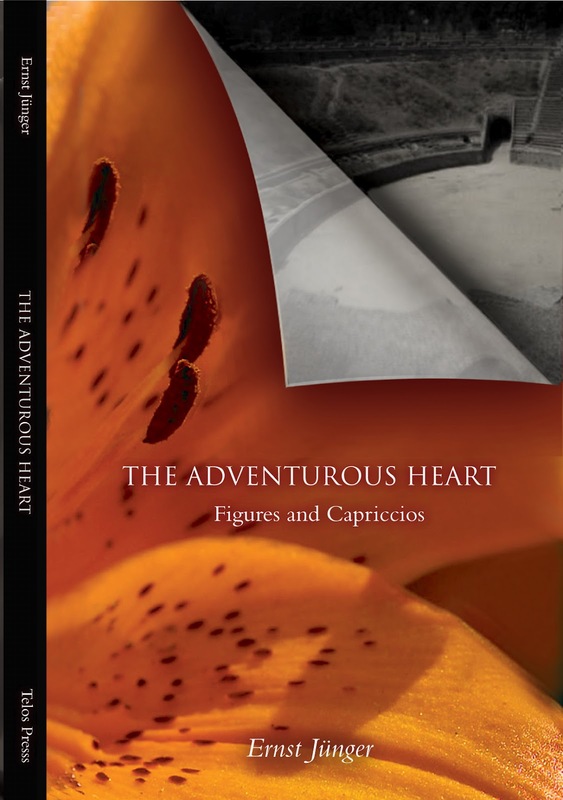 Figures and Capriccios". I might be permitted to add one or two more, then it will in any case be September and you can order the book yourselves from Telos Press! Higher insight does not live in the separate compartments but in the structure of the world. It corresponds to a mode of thinking that does not move around in isolated and parceled-off truths but rather in meaningful connections, whose power to order lies in its combinatorial faculty. The tremendous pleasure that comes from engaging with such minds resembles a walk through a landscape distinguished as much by the span of its boundaries as by the richness of its particulars. The viewpoints alternate in a whirl of multiplicity, yet all the while the glance takes them in with an even serenity, never losing itself in abstrusity and malformations or in pettiness and eccentricity. Despite the plethora of variations that the mind is able to generate and the ease with which it can switch fields, it perseveres with effortless rigor in making its connections. Its powers appear to grow as much when it turns from the motif to the execution, as when it returns from execution to motif. Using a variation on Clausewitz’s fine image, we can compare this mode of movement with a walk through a convoluted garden in which we are able from every point to see the high obelisk erected at its center. The combinatorial faculty differs from the merely logical one in that it proceeds with a continuous sense of the whole and never loses itself in singularities. Where it does touch on the individual instance, it is like a compass made of two different metals, whose gold point is seated at the center. In this manner, it is dependent to a far lesser degree on data; it disposes over a superior mathematics that understands how to multiply and exponentiate, while normal arithmetic has to make do with simple addition. Hence, when a genius cares to enter the field of science, he engages in a brief, decisive clash with the specialists, who are basically only able to engage him in a straight line, while he can effortlessly outstrip and cut them down from the flanks. His preeminence emerges soonest and most brilliantly in the art of war. To the extent that one of the intellect’s tasks is to order things according to their relationships, the combinatorial inference shows its superiority by its mastery of the genealogy of things and its ability to trace their deep affinities. Simple inference in contrast finds itself limited to determining the superficial similarities and so breaks its back in measuring the leaves on the genealogical tree, while their fundamental dimensions in fact lie buried in the germinal cells of the roots. Incidentally, an eminent specialist too may be recognized by his disposition over more comprehensive reserves than are comprised in his discipline. Every significant individual work has at least a drop of the combinatorial faculty mixed into it—and how inspired we feel when we stumble already in the introduction across those simultaneously powerful and playful sentences by which sovereignty shows its presence. This is a salt that withstands time and all its advances.